Here’s a cautionary tale for those of you who aren’t paying close attention to your doctor bills: Four times this past year, I was double-billed for the co-payments I am required to pay at each doctor visit. I always pay cash for those payments, and I request a receipt. But in each of those instances, I later received bills for the amount I already had paid. I am not the only one having this double-billing problem. Health-care industry reports suggest that double-billing is growing as more consumers have insurance plans that require point-of-service co-payments and/or have high deductibles (the amount you pay before your insurance kicks in). • Get it on paper. The first—and most important—step is to create an annual log or list of your medical visits. I keep mine in separate file folders for each month of the year. Here’s what I do: On a single sheet of paper, I list the date of my visit…the doctor or medical service I received…and any payment I made at the time of visit. I attach to that single sheet any receipts that I received for payments I made. If I have multiple medical visits in any given month, they are put into the appropriate monthly file. You can also maintain a log of your visits on a computer, but keep a file folder for the actual receipts. Insider tip: Always get a receipt for any amount (even if it’s small) you personally pay in cash or by credit card or check at the time of your visit. This will prove that you have already paid if an issue arises later. Keep your receipts for 18 months—providers usually have up to one year to submit claims. • Check your EOB. In most cases, anywhere from a few weeks to many months after your medical visit, you will receive an “Explanation of Benefits” (EOB) from your insurance company or Medicare explaining what the insurer was charged, what the insurer paid the provider and how much you’re responsible for. Look carefully at what each EOB says you owe. It may very well be the co-payment that you’ve already paid. You may also owe the provider for your part of any deductible you have not already met in that calendar year. Attach the EOB to your log sheet for that visit. 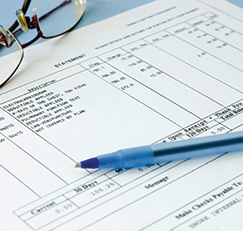 When and if you receive a bill from the provider for that service, check it against the EOB and your earlier receipts. Insider tip: Never pay any portion of your deductible to a provider until your claim has been submitted and your EOB received. If you are on Medicare, it is illegal for the provider to require payment before that time. Most private insurers have the same rules. By waiting, you allow the insurer to make sure the amount billed is correct. There’s also a chance that by the time the bill is submitted, you will have met the deductible through payments to other providers. • Get help—fast! Despite all your record-keeping, you may still have a problem with a provider who thinks that you owe him/her money. Don’t wait around hoping the problem will go away. Doctors and hospitals are turning “overdue” bills over to collection agencies after two or three months. Immediately call your insurance carrier or Medicare/Medicaid, and ask for help. Your insurer will usually be able to get the issue cleared up quickly.